Let's eat ñoquis on 29th! In Argentina it's a tradition to eat ñoquis on 29th of every month. Putting a banknote under your plate should bring you good luck and wealth. 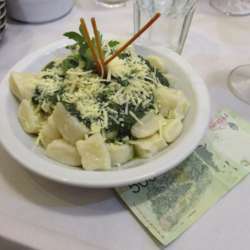 Let's follow this tradition and eat the delicious "ñoquis del 29" which offer Protected content , a tipical "porteño" restaurant with great ambience.